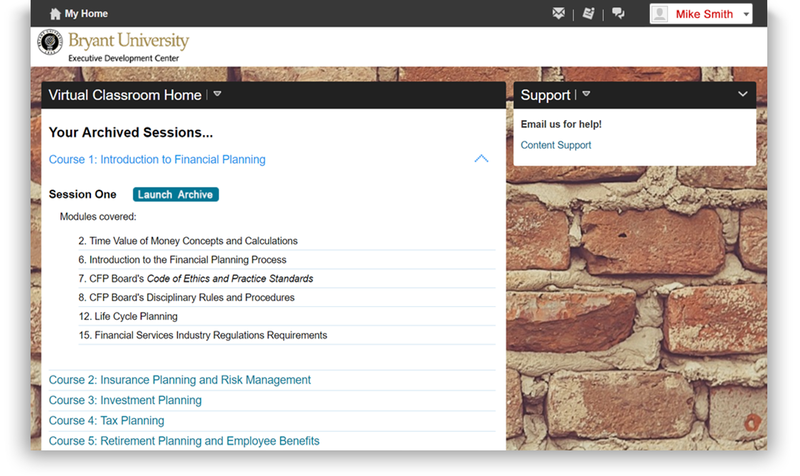 The Virtual Classroom Program puts you on pace to complete Bryant's CFP® curriculum in only 10 months. A total of 18 comprehensive Virtual Classroom sessions cover Bryant's 6 core CFP® courses. Each course has 3 specifically designated 2-hour sessions, which each cover one-third of that course's topics. The sessions are held every 2 weeks in order to give students more than enough time to work through the topics in advance. During the 2 weeks leading up to a session, you become familiar with your strengths and weaknesses. As a result, you are better prepared to maximize the value of each session. You are aware of the areas where reinforcement is needed most. When those areas are addressed by the instructor, you are able to ask as many questions as you wish to nail down the subject matter with 100% certainty. Despite having 2 weeks between sessions, you are put on pace to complete each course in only a month and a half. By following this pace, the 6 core CFP® courses can be completed in only 9 months. The Capstone course takes most students about another month, taking your total time to complete Bryant's CFP® curriculum and fully satisfy CFP® Board's Education Requirement to a very quick 10 months. Every Virtual Classroom session is fully recorded and archived. Each archived session is posted to the Bryant Learning Platform the following morning. You may access any session you wish at any time while enrolled in the Program. Students who enroll in a Full Program are granted 21 months of access. The archives allow you flexibility; you can miss a class when the inevitable conflict arises and still access the valuable information that was covered at a later point in time. Once students complete the Bryant CFP® curriculum and have turned their attention towards preparing for the CFP® Exam, the archives become an excellent tool. Again, you have access to all archived sessions for the duration of your 21 month enrollment. Students seeking strong results often view the entire 36 hours of archived content during their final few weeks of Exam preparation. Others choose to jump directly to topics of need and rewatch the discussion surrounding that topic several times until their understanding is rock solid. Either way, topics which were initially covered upwards of 10 months ago are fully refreshed, and you walk into the Board Exam with tremendous confidence. The live interaction with our team of CFP® instructors is what really seperates the Bryant Virtual Classroom from the pack. Each instructor is a subject matter expert on the specific topics that they teach. For example, David Materese is uniquely qualified to lead our Tax Planning course as both a Certified Public Accountant and CFP® Professional. Each and every day he builds financial plans for clients with special attention paid to tax-related issues. He is the perfect guide for Bryant's Tax Planning course. It's important to understand that Bryant's dynamic team of CFP® instructors are constantly available and not just once every two weeks during the Virtual Classroom sessions. All students are provided with full email access to the full team! It's not just the interaction with terrific instructors that makes the Virtual Classroom Program so useful. Equally important is the structure the Virtual Program provides. Instead of being tasked with completing all 7 Courses on your own, you are tasked with completing only 4-6 modules every 2 weeks. Why climb a mountain on your own when you can instead walk up several small hills with a guide? Bryant students often comment that they appreciate the steady "two weeks at a time" routine that the Virtual Classroom sessions provide. The underlying curriculum that the Bryant University CFP® Program is built upon has consistently outperformed the national average success rate on the CFP® Board Examination. Over the past 15 years students learning from our curriculum have experienced average pass rates more than 20% higher than the national average. Find answers to the most Frequently Asked Questions about the Virtual Program.